I am a freelance website designer. 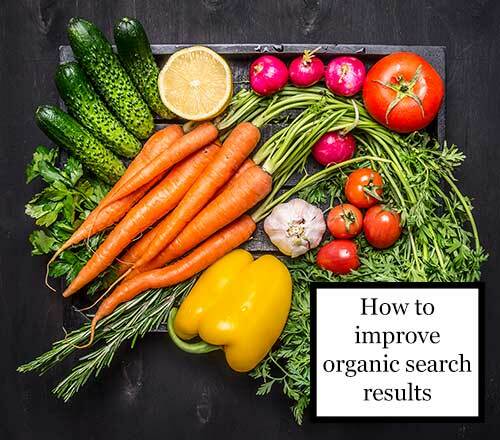 In this post I cover how to improve organic search results. There is more to organic search engine optimisation than meets the eye. Gone are the days of simply adding a few choice keywords to the header of a page and hoping to get good results. Google looks to give its users the very best result when they do a search. That is why Google is currently the most popular search engine. If your website is full of fluff, nonsense or very little you will not gain good search engine results. Results are produced depending on the country the user searches from, the type of search ie. a local service or eatery, and type of device used to do the search. Over the years, ‘dodgy’ search engineers find ways to get pages listed in unorthodox manners. Plus the way the internet is used changes incredibly quickly. Google continuously works to weed out black hat practises, like keyword stuffing, and strives to improve user experience. That is why search engine optimisation continuously changes. That is why TODAY the only way to improve organic search results is to be informative, honest and open. To improve organic search results a business owner must be prepared to spend time, and often money, improving and analysing web pages. There is no quick trick to gaining good search results and hanging on to them. Elements that will effect your overall search engine rank area listed here. I then extend on each in the post below. The programming of your website. Hierarchy of the categories and pages. Valuable, up to date content. Page layout including readability and internal links. Meta-title and description, keywords within the page. Back links and website popularity. Good search engine rank begins with the programming of a website. Google must be able to crawl the website easily. Fast loading websites optimised for mobile as well as desktop will be ranked higher. Mobile users have a much slower connection than a desktop user. Google knows that a user will not wait for a web page to load, so penalises slow loading websites. Code or large images can slow web pages down. Providing the information quickly to a user will also get a page ranked more highly than the next. Displaying information at the top of a page, as oppose to a large image, could make a big difference in page rank. Users often spend very little time on one web page, as pace of life is so fast. You may ask yourself “what is the point If someone spends so little time on my site?“. The point is that if one page of your site ranks well, the next page will have a higher rank, even if certain elements are not perfect. The point is that people see and recognise your brand as they are searching on the internet over time. The point is, if you are not there, there is no point. Google looks to provide users with the most relevant web page associated with a search. If you are not providing that content, there is no way you will rank. Users ask questions, Google provides. You should be writing copy in a blog or on your website around your industry, answering questions that your clients ask. Website copy should always be written for humans, not search engines. Use key phrases that resonate with a target audience. Each page should have 1 key phrase used throughout paragraphs and headings. Search engines value quality content and returning visitors. Search engines engage with fresh information. You will be penalised if you repeat text on your own site or copy from other websites. Copy should be included on the page in the correct structure, using the right tags. Using headers and breaking the text up not only helps visitors to easily read content, but helps search engines to decipher it so they can rank the page. The you can see on your browser tab is the page title. This is an important tag to inform search engines on the page topic. The title tag has to be relevant to the copy on the page, and it is useful to use your targeted key phrase here too. Naming a page about garden design “page1.htm” will be unhelpful to search engines. Naming that page garden-design-oxfordshire.htm will mean that search engines have a clear understanding in what the page is about. Meta-tag descriptions should always be used and need to run parallel to the rest of your strategy. Search engines do not “see” images, they trawl lines of coding. Save images in a descriptive manner and always add a TAG to it, explaining the what it is. That way it can be clearly distinguished to the search engines. They will use that name in listings and in Google Images. The sites that link to your website (inbound links aka backlinks) provide context about the subject of your site and can indicate its popularity. The more links you have coming in to your website, from quality, relevant websites, the better Google ranks your website. Links to your website include relevant websites as well as posts on Facebook, Twitter, Pinterest and other social networks. Links should be accumulated naturally. Taking part in link reciprocal exchange schemes or link scheme (such as link wheels or link pyramids) disregards the quality of the links or the sources. This is in violation of Google’s Webmaster Guidelines and can have a negative impact on your site’s ranking. Too many links can have the wrong affect on your websites ranking. DO NOT pay for back links – most of them will be irrelevant and you could earn a Google penalty. Having outbound links to additional information provides evidence that you are including value for your visitors. User activity demonstrates people are getting value out of your site and that has a positive impact on your search listings. Remember: you will be penalised by Google for over optimising a website. You need fresh, original content and a well designed website.